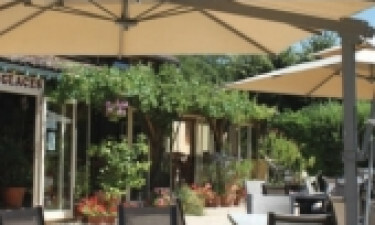 The le Caeyrou campsite in Dordogne is nestled at the foot of a feudal castle where in the evening, one can sometimes observe lights flickering on and off. The hilltop castle overlooks the entire valley. The village is at the foot of the hill, and the paths are steep to climb, but the rewarding views make it worth the effort. The tranquil countryside, the colour of the stone, the view over the roofs of the village, and, of course, the view of a beautiful little campsite nestled underneath ... it's Camping le Capeyrou! Why should I choose Camping le Capeyrou? When you book a holiday through LUX-camp, you can be sure of a luxury camping site that has all the conveniences and amenities needed to make your camping holiday relaxed and carefree, and Camping Le Capeyrou is no exception. There are many different types of luxury camping lodges from which to choose, including mobile homes. Throughout this location, a high standard of cleanliness is viewed as mandatory. 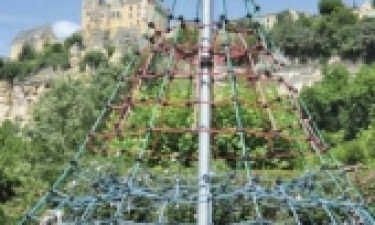 Beyond the castles of Beynac, Castelnaud and Marqueyssac that are a walking distance from the campsite, there are many other sites and activities that can be discovered in a radius of 10 km. Sarlat is a must. Architecture is the keyword; simply stroll through the streets and alleys to discover its unique charm. Domme is another village "perched high", offering beautiful views of the verdant shades of cultivated fields, the meandering Dordogne, Perigord and other villages. Beautiful fortified gates help to put a beautiful walk in perspective. Other ideas for family days out include day tours to the Vallée de la Vézère, where you can admire world-famous prehistoric paintings, or a descent into the bowels of the earth via the caves of Rocamadour and the Padirac. Watch your children make memories that will be treasured forever as they play in the adventure playground for children aged 0-6 years, which has a little house, slide, and roundabout installed in a large white sandy area, and there are also swings and spring toys. Slightly older children can hone their skills by climbing through the large spider. Children of all ages love making dams and walls out of stones in the nearby rivers of Dordogne or Céou! The site is within walking distance to some nice bars and restaurants. There is a bar, and food vans visit on different days each week, giving you the chance to buy takeaway pizza or burgers. 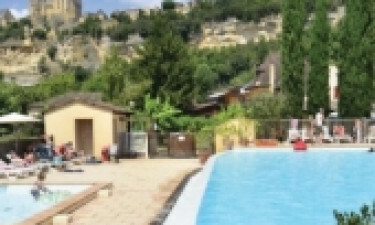 There is a 20-metre pool that is heated all season, as well as a paddling pool for children; the surrounding deckchairs and sunloungers are among the best places to admire the Beynac Chateau.